BMW's M5 is the yardstick against which all serious performance saloons are judged, a car that in fifth generation form got turbo power for the first time, courtesy of a 552bhp 4.4-litre V8. It was 10% more powerful yet 30% more efficient than its V10 predecessor and featured a trick diff got the power on tarmac. So, how does this 'F10' generation M5 stack up as a used buy? Super saloons may come and go but one machine continues to define what a car of this kind should be. 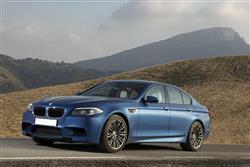 This one, BMW's M5. Since 1984 when the Munich maker first slotted the engine from its M1 supercar into one of its ordinary 5 Series sedans to create the world's fastest four-door, this has been the definitive motorsport-bred business blaster. With each generation, the formula has been the same: huge reserves of performance matched to state-of-the-art technology. What has changed though, has been the configuration of engine required to deliver these benchmarks, with BMW's M division breathing on everything from straight sixes to a couple of 5.0-litre powerplants, first a V8 and then, for the MK4 'E60 model, an even more manic V10. For the first four M5 generations, only normally aspirated units were used but when the switch was made to this MK5 'F10' model in late in 2011, a 4.4-litre V8 was introduced with twin turbos boosting its output to a frantic 552bhp. Enough back then to make this unit the most powerful BMW series production engine the brand had yet produced. You might have thought that this would have been a difficult product to launch in an era of eco-consciousness but BMW said not, proud of the way it had created a 190mph machine still able to deliver up to 30mpg at cruising speeds and put out no more CO2 than a humble Ford Cortina, thanks to running costs slashed by 30% over the previous version. Certainly, this flagship 5 Series was a massively different ownership proposition to its V10 predecessor, which was a thirsty beast with a clunky gearbox that forced a motorsport mood upon you whether you wanted it or not. The 'F10' M5, in contrast, was a far more sophisticated proposition. The most capable super saloon on the planet from its era? Very possibly. The car was launched n 2011, then power was raised from 552 to 560bhp later in 2012 and at the same time, a 'Performance Edition' was introduced. A lightly facelifted model was introduced in 2013. In 2014, a 'Jahre Edition' 600bhp model was introduced. 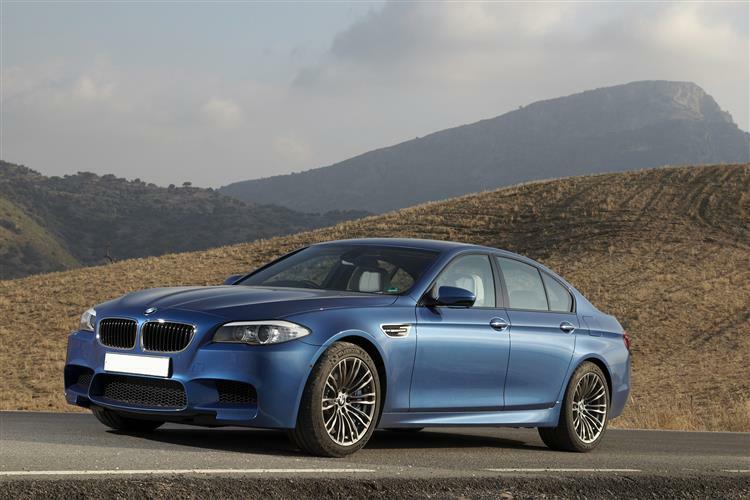 The 'F10' M5 sold until early 2017 and the introduction of the replacement 'F90' model. M5s have always been good at dialling down the aesthetic excess to create a potent, yet low key appearance that'll let you get away with using more of that performance more of the time. This one is no different, understated to a tee, just as most owners will want. Compared to its predecessor, this F10 generation car cut out the take-aways and hit the gym a bit harder, with a far more lithe profile and sleeker detailing. Being longer, wider yet lower will do that for you. Couple that with some more overt M styling touches and you're left with a more confident design that shares only 20% of its parts with a regular 5 Series. At the front, the broad black grille slats and the trio of air intakes that cool the big V8 combine with the LED light rings and bi-xenon main beams to afford some serious rear view mirror presence. The wheel arches are gently teased over 19-inch wheels as standard - but many original owners opted for extra-cost 20-inch rims. Though the wheel spokes, you glimpse the six-piston fixed callipers of the high performance braking system. The lowered suspension means the car's stance is spot on, the wheel arches properly stuffed and with the perfect amount of ramp angle in the body to give the car a tense, poised appearance. The rear view contains a four-pipe exhaust pack, divided either side of the diffuser, whilst a small flap on the rear edge of the boot lid provides additional downforce at speed. Inside, as usual with BMW cockpits, the driving position is dominated by a central 10.2-inch colour screen that marshals the functions looked after by an iDrive system that in this form was much simpler and more intuitive to use. If you thought though, that the whole purpose of iDrive was to reduce cabin button clutter in cars like this, you might be interested to note that before you even get to the myriad of functionality that is iDrive, there are no fewer than 58 buttons to get to grips with. But then the controls of any sophisticated race-bred performance car are likely to feel daunting at first glance. 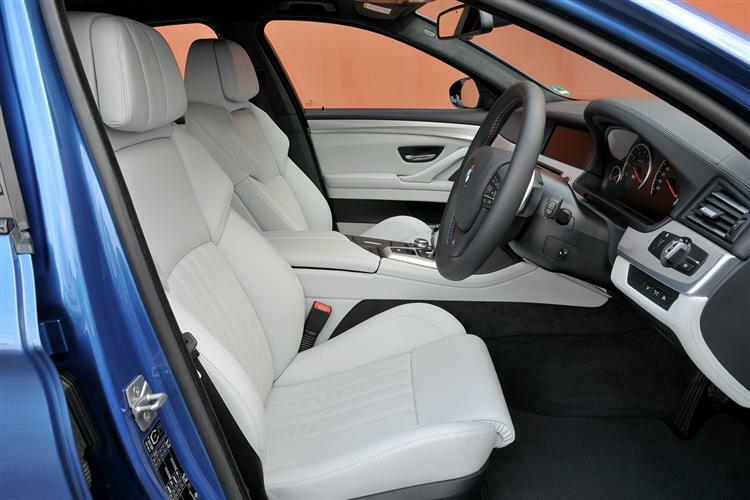 And race-bred this M5 most certainly feels, from its M Sport seating to its aluminium trim, from its red-needled white-lit M circular instrument dials to its grippy three-spoke M leather steering wheel. As ever, this remains a practical supercar, so up to three adult rear seat passengers can join you as you power from 0-124mph in just 13 seconds at the beginning of a tyre-smoking lap of somewhere like the Nurburgring Nordschleife. You can easily sit one six-footer behind another, with head and elbow room to spare. 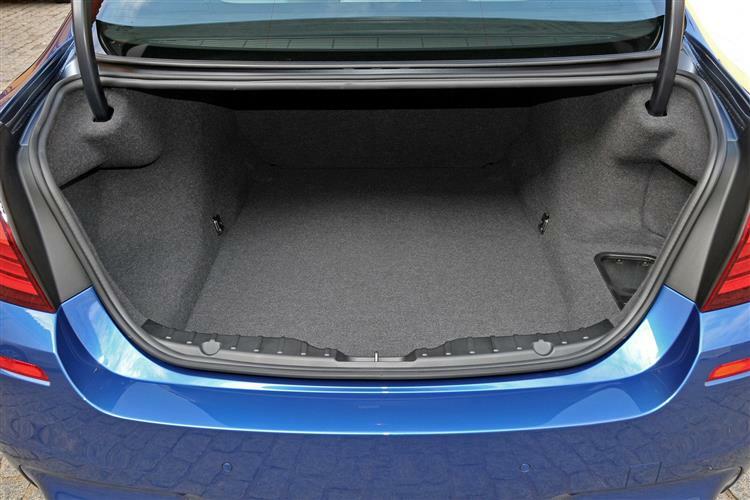 And your passengers' belongings can be equally comfortably ensconced in a spacious 520-litre boot nearly double the size of that in, say, a rival Lexus ISF. 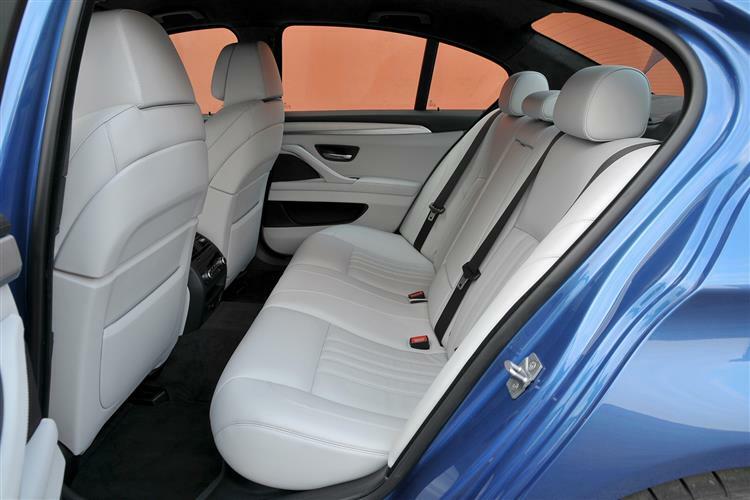 A space that's further extendable if you get yourself a car fitted with the optional split-folding rear seats. 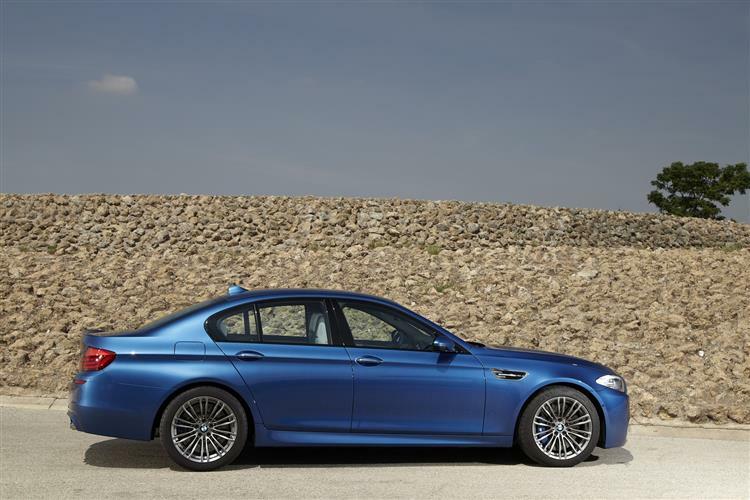 There are a few known problems with F10 generation M5s. Look out for a clunking / loose noise from rear on bad roads, caused by defective spring coils. BMW fitted upgraded spring coils from December 2012 production onwards, so this issue should only afflict earlier cars. Also look out for a wind rattle/fan rattle sound when car is under throttle. This is caused by a loose pipe clip on the induction system. Some owners have reported that the brake pedal becomes very soft after a few minutes of hard driving, lengthening stopping distances. This is down to limitations with the standard factory-fitted brakes and there's not that much you can do about it other than limiting really hard driving to just a few minutes - or finding a car that was originally fitted with the expensive optional ceramic brakes. Some owners have reported an occasional message that comes up on the dash reading "Drivetrain error. Maximum power not available". This is down to a flaw in either the fuel pressure sensor or the high pressure fuel pump but this was possibly fixed on cars produced after February 2012.We've also come across reports of F10 owners experience dash messages reading 'Brake system failure'/'Tyre pressure sensor failure' or 'Driving Stability Control failure'. This references a brake pad sensor failure. (approx prices based on a 2014 M5 ex VAT) An air filter costs in the £37 bracket and an oil filter costs around £32. Brake pads at the front can be pricey; we were quoted as much as £386 for a set. Pads for the rear seem to be much more affordable; we found a pair priced at around £68. Wiper blades cost in the £5 to £20 bracket, though you could pay up to around £38 for pricier brands. A heated wing mirror glass could cost you up to around £120. 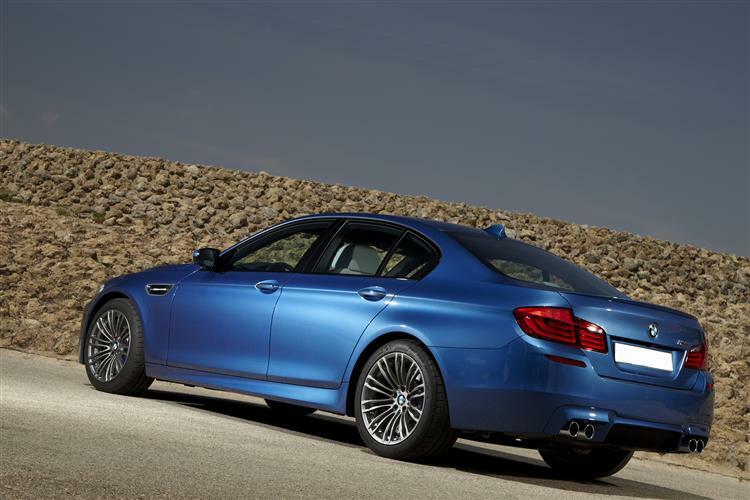 This F10 M5 model's 4.4-litre V8 is the most potent engine ever devised by BMW's high performance M division. Fire it up and the fun begins. It isn't just the extra 51bhp it offers over the old V10 that matters. More important, the Munich maker promises, is the way that the power is far more accessible, from a car far simpler to drive. Simple to drive? Modern M5s have never been that - nor, you could argue, should they be. But complication did reach rather ludicrous levels in the old V10 model, a car with no fewer than 11 different gearshift modes, all of them clunky and prone to embarrassing hesitation. This time round, the much more sophisticated 7-speed M DCT dual clutch system can operate either as an auto or, if you flick the gearstick or better still brush the wheel-mounted gearshift paddles, a sequential manual. Within each mode, you'll find three settings, alterable via a rocker switch, to change the speed of the gearshift. Get it working to your liking and the shifts are racecar-quick and delivered with Schumacher-style aural fireworks. Simple enough so far? Ah, you haven't heard the half of it. Arranged in horseshoe formation around the gearshifter are the controls that'll enable you to set your M5 up to your own personal preferences, just as a race driver would set up his racecar. Through these, you can adjust the steering weight, suspension stiffness and throttle response through three different settings. Further factor in the three modes provided by the DSC stability control ('On', 'Sport' or 'Off') and you have a mind-boggling 243 possible different combinations. Which is why, to make it all so much more straightforward, BMW helpfully provides shortcut 'M1' and 'M2' buttons on the steering wheel. Holding each button down, just as you would save a radio station on a stereo, enables you to quickly record your two most commonly used settings. So for us, 'M1' is flat out and ballistic for when our favourite stretch of backroad opens up and we want everything 'Sport Plussed' to the max. 'M2' meanwhile, we would select on the traffic-clogged drive home when we want to forget that we've got ourselves a road-legal DTM racecar and pretend we're in a leather-lined 7 Series limo instead. In fact, limo mode is something this car does rather well - in stark contrast to its brooding V10-engined E60 model predecessor, which never really felt really at home on anything other than a fast flowing road, an autobahn or a racetrack. In this car, well, it's happy anywhere. In town, there's a low speed assistance function on the gearbox that keeps you moving silkily through heavy traffic with but the lightest touch on the accelerator. And bumpier roads towards the city limits are dispatched with arguably the most compliant ride you'll find in any 5 Series model, providing you select the adjustable damping system's 'Comfort' setting. Yes, yes, all very nice - but how fast is it. With up to 560bhp on tap (or 600bhp in the rare 'Jahr Edition' model), you'd expect the performance box to be fully ticked. It is. Even if you don't use the M launch control system, you should be able to get somewhere near the standard variant's quoted 4.4s sixty from rest time on the way to a top speed that, on a car whose original owner specified the optional M Driver Pack that removes the 155mph limiter, is up around 190mph. Don't doubt us when we say that this is almost certainly going to be the quickest thing you'll have ever driven, even if your oak-panelled garage is already full of Ferraris and Lambos. With these kinds of machines, like the old V10 M5, you'll have to be up around 4,000-5,000 revs to get the engine at full chat: here, peak torque is accessible from just 1,500rpm, giving this M5 the sort of effortless thrust that drivers of more powerful supercars can only dream about. But speed of course is nothing without control. To aid with that, this M5 provides a clever Active M differential that delivers power to the tarmac so effectively and offers so much traction that unless you disable the DSC or conditions are really slippery, the tail's never even going to think about swinging round on you. Good to know. Especially when you're barrelling down your favourite B road or better still, flat-out on a track day, everything ticked-up to 'Sport Plus'. No of course a two-tonne super saloon isn't going to change direction with the agility of a Ferrari, but that trick diff does a good job of disguising all that bulk. And we'd be lying if we told you we thought the deep bassy soundtrack of this V8 as good as the gravelly roar of the old M5 V10. But all of that gets forgotten when you start to drive this car as the Munich men intended, ideally on track. Yes, we know the average M5 owner doesn't venture off the Queen's highway - but the average M5 owner is missing out. Lack of confidence is no excuse: get on an airfield with an instructor and enjoy the delicious way that barrelling out of corners, you can turn this car with the throttle. Believe us, it's worth smoking through an expensive set of Michelin rubber for. Here, there are very few of the gadgets that BMW says are needed to make an ordinary 5 Series into a 'driver's car' - things like rear-wheel steering, variable-ratio electro-mechanical steering, active anti-roll bars: none of that. An M5 doesn't need it. It only needs you. And an open road. A quarter of a century of normally aspirated engineering excellence for BMW's M division came to an end with the launch of this 'F10' generation M5. And a new turbocharged era began, a time in which the market's defining super saloon became faster, yet more frugally efficient as it re-invented itself for the modern era. Everything that was wrong with its much admired 'E60' predecessor - the thirst, the awkward gearbox, the choppy day-to-day personality - was corrected in this car with a clinical ruthlessness that may leave some a little detached from this car's fire-breathing personality. For many more though, this BMW defines the super saloon market from its era, in fifth generation form more than ever able to be all things to almost all people, luxury limo one minute, circuit star the next. It's everything an M5 should be.